L.A. Sparks all-star Lisa Leslie, 36, has had many career achievements, including being the first female to ever dunk in the WNBA. She is a fantastic player and the No. 1 draft pick of the first WNBA draft. Knowing all of her accomplishes and what she has brought to the game, it is hard for her fans to let her retire. In 2008, I went to Atlanta, GA. to watch Leslie and Candace Parker take on the Atlanta Dream. Even after giving birth to a baby girl, Leslie didn't miss a beat. She was grabbing rebounds and allowing the ball to roll off her finger tips for shot after shot. It was an amazing game to watch. One year later, Leslie announced that she will be retiring at the end of the 2009 season. While I imagine this is hard for Leslie, it must be incredibly difficult for the L.A. Sparks, who are going to be losing the best athlete in the WNBA. With Leslie gone, the Sparks will most likely turn to second year Parker to fill her shoes. Parker was the first pick in the 2008 draft and was the first player to win both the MVP and Rookie of the Year Award. Whatever the case, Leslie is the face for the Women's National Basketball Association and will continue to shine on with her career highlights and mind blowing achievements. Vanderbilt commodore fans were on their feet today cheering as the women's basketball team steamrolled Georgia with back-to-back baskets down the stretch and 9-20 3 pointers. Vandy won 80-64. The theme Memorial Gymnasium in Nashville, Tenn. today was "Pink Zone/Think Pink" to raise awareness and money for breast cancer. Throughout the first half, there were a significant number of lead changes, and one tie, 24 up, with 2:36 to go. Vandy's Jessica Mooney definitely made the play for this team with an assist, steal and layup down the court that allowed Vanderbilt to take the lead. Vandy led by five points at halftime. Starting out the second half, Georgia tried to come strong with a basket from Christy Marshall, but could not match the intensity of Vandy's Tuomi Hannah. Hannah ended up with 10 points. Mooney only had 4 points but made the last two shots of the game on the foul line. Photo: Georgia head coach Andy Landers hangs his head after another disappointing play. This picture is not taken from today's game against Vanderbilt. Tonight I had the pleasure of watching Nate Robinson hang on the rim after completing an amazing dunk from the left corner. Following this, Dwight Howard soared through the air and forced the basketball through the net. From a distance it looked like this man was flying. Afterwards, both Robinson and Howard got together to do an impressive dunk. Howard put on a red Superman cape and stood in front of Robinson at the rim. Robinson ran from the half court mark and jumped over Howard for the dunk. Lebron James, who was watching from the audience, announced tonight that he would be competing in the 2010 dunk championships. Without the talent of Lindsey Harding, Alison Bales and former head coach Gail Goestenkor, Duke seems to be struggling. Even though it still has the leadership of Abby Waner, who played alongside Harding and Bales, the team is lacking an important element. Then again Duke is ranked No. 4 in the country this year, which is why fans have been scratching their heads wondering why they fell to No. 8 North Carolina on Monday in Chapel Hill. When these two teams compete there is always rivalry, but it looks like Duke pretty much handed the win to the Tarheels. Chante Black, who has stepped into Bales shoes, led Duke with 13 points. Following her, Abby Waner and Jasmine Thomas had a collective total of 22 points. On the other side of the court, Rashanda McCants had 22 points alone. And even though North Carolina led in rebounds with 4, the number for both teams was significantly low. I just hope that these new players can unite their teams together and start playing at a national level again. With hundreds of Web sites like Juicy Campus closing because of a decrease in online advertising, it is only a matter of time before certain sites such as Facebook and Myspace might have to consider the same option. Facebook has made 24-year-old Mark Zuckerberg a rich man and has simplified the social networking for teenagers and adults who can communicate with only the click of a button. In 2006, Facebook rejected $1 billion dollar bid from Yahoo!, but accepted $250 million dollars from Microsoft Word in exchange for a 1.6 percent share. As of now, online advertising doesn't seem to be slowing this social site down, but as economic times get worse more sites will begin shutting down. Especially, if business owners don't understand the value of online advertising. Only time will tell what will happen to this multi-billion corporation we all love to update our statuses on, making it a little too easy for stalkers to track us down. After photos were released of swimming eight gold medalist Michael Phelps smoking marijuana in a bong, he's been under constant media scrutiny. USA Swimming has announced that they will be suspending Phelps for 3 months, and will not compensate him with financial support during this period. Even though USA Swimming is taking action, a cereal and snack company, Kellogg Co., has agreed to renew their contract with Phelps despite the photos. Because of the 3 month suspension, Phelps will not be able to compete in March at a meet in Austin, Texas. He will have to wait until May, which could jeopardize his placement in the July world championships in Rome, considering he would only have two months to practice. A Minneapolis 8th grade teacher sent an e-mail to faculty entitled "Torture Time!" asking for suggestions for a Holocaust simulation she was planning for her class. The e-mail asks teachers to participate in a day of sheer pleasure where they become Nazi Officers and Adolfs. School Principal Coleman McDonough said that the teacher was trying to be sarcastic and humorous. He said the e-mail was in poor judgment. The e-mail also stated that children would be forced to wear yellow stars, and would actually have to pay $10 for them. The teacher said that if they died during the project then she would keep their money, and for those who couldn't afford the badges she said she would threaten detention. If the students managed to survive then she would return the money. While I believe this teacher went about the project the wrong way, I believe she originally had a good agenda. She wanted to bring the seriousness of the Holocaust to life, but that's hard to believe when she's practically joking in an e-mail. The Holocaust killed nearly 6 million Jews, so bringing attention to it is important in the classroom. But reenacting and joking about it is not. UT Lady Vols head coach Pat Summitt reaches her 1,000 win against University of Georgia in Thompson Boling Arena on Thursday, Feb. 5. The Lady Vols had hoped to gain the win for their coach on Tuesday against Oklahoma, and even though they played their hearts out, they could not match the defensive efforts of Courtney and Ashley Paris. Tonight the Lady Vols shut down Georgia with a 73-43 win despite Vicki Baugh's knee injury on Tuesday. She will not be out for the rest of the year. Alicia Manning also experienced a thigh injury tonight, but continued to sit on the bench and support her team. Following in her teammates footsteps, Glory Johnson stepped up and filled the role for Baugh by grabbing rebound after rebound and putting up jumpers. Shekinna Stricklen backed Johnson up and had a remarkable night, but hit the hardwood pretty hard during the second half, causing her to sit on the bench for several minutes in the second half. While all these injuries might have given Georgia an advantage, it didn't. Georgia still trailed by 30 points with 10 minutes to go in the game. After the game, Summitt was presented with several gifts including the game ball, a painted portrait and jewelry. "We have the greatest fans in women's basketball," Summitt said. "I want to thank the administration for giving their commitment a long time ago before it was popular to women's basketball, and what a difference it's made." Summitt said that she has been extremely blessed in her coaching career. "We may be young and we may be inexperienced, but our goal is to be in St. Louis for the final four," Summitt said. The young girl climbed into a washing machine and her 15-month-old brother started the device, according to Orange County Police. The machine's controls were said to be push buttons located 20 inches from the ground; therefore, her younger brother had easy access to them. The little girl had been tumbling in the water filled machine for two minutes before her mother found her. As of now her death has been ruled accidental. Middle Tennessee women's basketball team achieve 15 wins in a row at Denver. After the big win against Denver, MT is now tied for third nationally and handed Denver their first loss in the Sun Belt Conference in Denver. Junior forward Alysha Clark racked up her 11th double double, while junior forward Jackie Pickel set the net on fire with 3-pointers from behind the arch. She walked away with 13 points. At halftime alone MT held a 25 point lead, and even though they were only up by 2 with 8 minutes to go in the first half, head coach Rick Insell found a way to fire up his team. Following her teammates, junior forward Brandi Brown had 18 points. 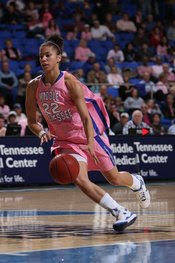 The Lady Raiders also had 17 steals and 20 assists, which ultimately added to the large deficient win. MT will take on Troy on Feb. 11 at 7 p.m. in Alabama. Philippa Curtis had sent and received 20 text messages before the collision that killed another driver in 2007. Curtis will serve 21 months in jail for being irresponsible and careless while behind the wheel of a moving vehicle. Because of Curtis' obsessive texting, she hit the stationary car of Victoria McBryde's car going 70 mph, resulting in McBryde's death of a serious brain injury. After crashing into McBryde's car, Curtis spun out into oncoming traffic and hit two more vehicles. Curtis told the court that there were times when using a cell phone while driving is acceptable. Just hearing these words, leads me to believe that Curtis is not sorry about the murder she committed at all. Obviously, texting instead of paying attention is just too important for this new inmate. Now the only communication Curtis will have to the outside world will be through a plate glass window. As of now, the legendary UT women's basketball coach sits at 999 wins. Pat Summitt has been coaching at UT for 35 years, and is second for most NCAA championships held. She now holds eight. Despite having a rough 2008-09 season with young and inexperienced players, Summitt has dedicated her life to the sport and refuses to give up on her team. Calling this a rebuilding year, the Lady Vols have been quite inconsistent. Sometimes they win and sometimes they don't. Sometimes they beat higher ranked teams and sometimes they get trampled on by teams that are not ranked. 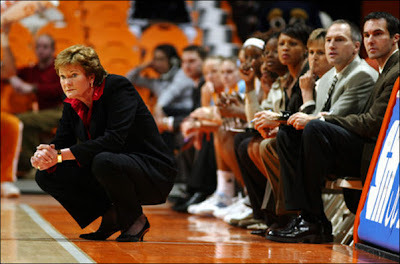 In January 14, 2003, Summitt became the first woman to reach the 800-win plateau. She also became No. 1 on the Division I all-time wins list in 2005, surpassing Dean Smith's record of 879 wins. She has signed and coached players like Candace Parker and Tamika Catchings, who now are WNBA all-stars. The Lady Vols lost to Oklahoma 80-70. Looks like Pat will have to wait for her 1,000 win against Georgia.